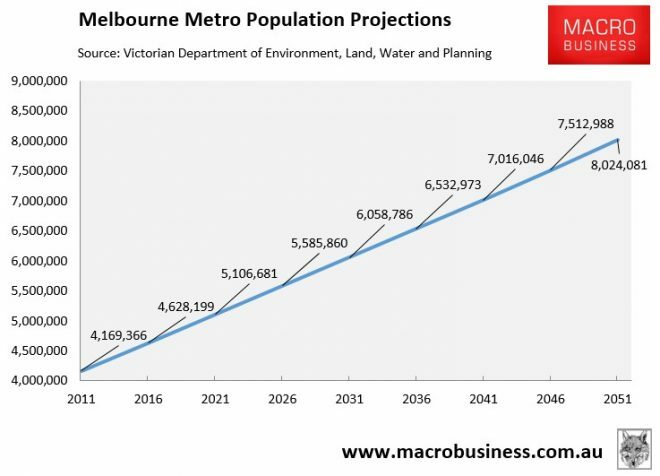 Every year Victoria’s population grows by the size of a packed MCG… and 92 per cent of them are headed towards Melbourne. Our roads are clogged, our trains are full and we can’t get inside trams let alone find a seat on one. The vastness of Melbourne is something to ­behold and the centralising of Victoria’s population continues as 92 per cent of new arrivals to Victoria stay in the capital. Melbourne is nowhere near as liveable as it was… Opposition Leader Matthew Guy’s vision is to decentralise Victoria and develop its regional cities, to take the pressure off Melbourne and grow country Victoria… The state desperately needs a government that is committed to decreasing the percentage of newcomers who make their home in Melbourne… We want to see more people commuting to ­Melbourne from regional Victoria — we can’t have a Melbourne that expands forever… An effective decentralisation agenda is key to improving capital city liveability and the economic wellbeing of the regions. In recent weeks – with little fanfare – the Andrews government slipped through a so-called “refresh” of planning laws, which encourages increased densification. Under the changes there will be less new housing built in Melbourne’s outer growth areas, and more built within 20 minutes of the city. The only way to keep the character of our suburbs, preserve our neighbourhoods, and cater for intense population growth, is to expand Melbourne, develop satellite hubs, and attract people towards regional centres. Anyone that has lived in Greater Melbourne over this period will agree that living standards are being eroded. Roads and public transport have been crush-loaded and housing has become hideously expensive. Decentralisation has been on Australia’s political agenda for around 100 years without success (other than the creation of Canberra). So what makes the Victorian Liberals believe they can magically turn the situation around? Short of locating government departments to the regions, what can the State Government realistically do? And what good is decentralisation if all it means is that ‘urban sprawl’ is replaced by ‘regional sprawl’ as the regions simply become commuter towns for Melbourne? Or, to put it another way, regional dormitory suburbs are created instead of fringe suburbs? 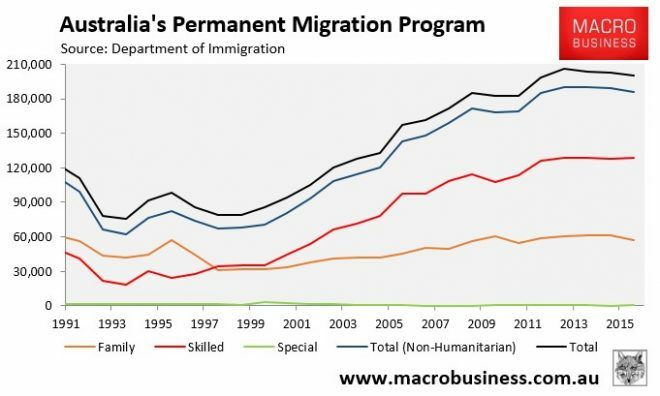 Rather than accepting mass immigration as a fait accompli, the State Liberal Party should instead lobby their federal counterparts to establish a national population policy that reduces immigration and does away with a ‘Big Australia’ on the grounds that is is placing undue strain on infrastructure and housing, and is reducing living standards of incumbent residents. Victoria’s politicians should also lobby for a greater share of tax revenues on the grounds that they are incurring the lion’s share of the costs from immigration, in the form of providing expensive infrastructure and social services. 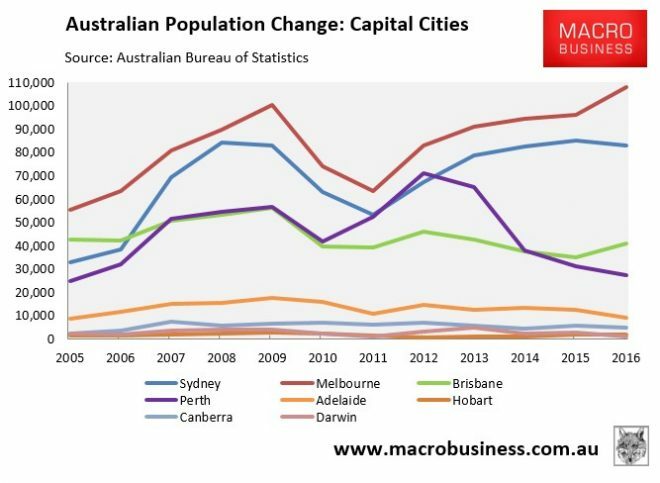 To the Liberal Party’s credit, they have at least recognised that Melbourne’s population growth is both unsustainable and unwanted. But they need to look at the root cause – excessive levels of immigration – and seek to bring it back down to sensible and sustainable levels. For its part, the Labor Government needs to open its eyes. Few Melbournians want a city of 8 million people. The one we have already is barely functioning properly at 4.6 million. $30/day for a train ticket, prohibitively expensive land tax, $10k/year for car registration, and steep fees on kids of 457 visa staff in Vic schools. Can they put in a rent tax? Charge 457 visa staff a $150/week rent tax! You will get only farmers in this country with such a policy. Sheep breeding will be your top science than. How do you plan to re-industrialise the country? You also need to import right people to follow the dynamics of the world in IT, science, medicine etc. Just don’t import slaves, and that’s it. Start to distinguish between the two. Jacob, not much point in suggesting ways for the government to dissuade people from coming here when their policy is to grow this population to the max as rapidly as possible. They will not be swayed from the destructive path we are on, so our first port of call is to let them know loudly WE DON’T WANT A BIG AUSTRALIA! To the Liberal Party’s credit, they have at least recognised that Melbourne’s population growth is both unsustainable and unwanted. oh come on, this is nothing more than chasing popularity. Get elected on the premise of saving Melbourne from population growth but once in government, maintain the status quo to profit from it. Does anyone really think Liberal or Labor will kill off Melbourne’s cash cow by handing it over to someone else to milk? Saint Matthew, I disagree. I haven’t heard them say it’s unsustainable nor unwanted. Neither have I heard Labor or Greens for that matter. It’s just taken as a given, that we are on this inevitable and enormous growth path. It’s never mentioned that something could easily be done to actually turn this ship around. 3% land tax in Melbourne and surrounds, 0.5% outside. Use proceeds to build serious infrastructure in the 0.5% tax zones. Wherever you draw that arbitrary line you will have people clustering on the fringe of it. If you are going to attract people into the regional hubs then you need to take into account the social aspect as well as the economic. Why do migrants overwhelmingly go into the capital cities? There are networks of their cultural group already there which make it easier for them to exploit whatever economic opportunity may exist, even if that economic opportunity is very small, while they are adjusting to their new environment (and adjusting to the new environment can be a scary and confronting process, I went to Beijing specifically due to the type of foreign population there rather than any other part of China). And if they come from a country that doesn’t have a significant population here, then there are still other groups they can attach themselves to. So if you want migrants to go regional you need to basically hand them a job and assign them an Aussie mentor who will assist them with finding housing, hold their hand through all interactions with the government for a year and just generally explain Aussie society to them (I can not see that happening). 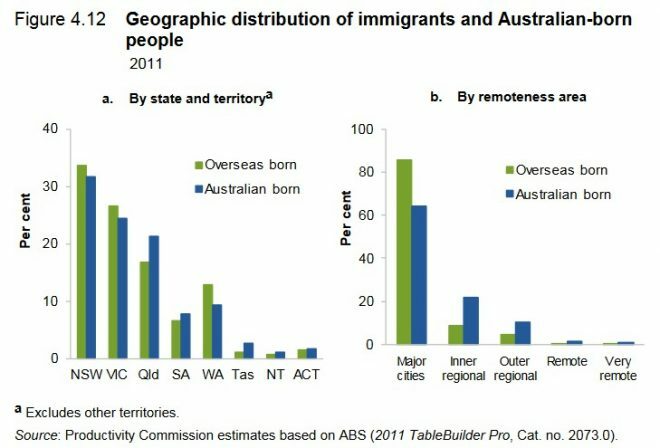 The other way to get decentralisation is for Aussie born to leave the cities and go regional. That will either be the poor being pushed out, or for the non-poor somehow there needs to be economic opportunities great enough to over come existing prejudices against regional/rural living and the risk to degrading existing social networks that the move will entail (nothing to be sneezed at because as we all know the quality of your contacts is hugely important for success in Australia). I do think we will see an absolute number increase in regional populations, but probably not in percentage. Don’t forget creation of wealth these days tends to occur in cities due to technological innovation and it ultimately ends up in the value of land. The underlying forces at work are unstoppable; even if our elites were not corrupt rent-seeking bastards you can’t stop this process only ameliorate it. Originally from a regional centre, which attracts significant new permanent residents and temps, along with Australians moving in. Common thread for any of these to fit in is having a family with kids at school, all become integrated. Issue is for singles, both Australians and temps, they’d all prefer to be in the city for social aspects and career opportunities. I’ve seen young Australian professionals try the bush but leave asap, mostly due to social issues if possessing skills to fill gaps, or unable to compete against locals on most positions. It’s all very well to pontificate on headline numbers and concept of managing labour market but as it stands, Australians cannot be compelled to work where they don’t want whether region and/or occupation; statistical or autarkist economies could in theory. The last thing Victoria’s regions need is vast numbers of economic refugees from Melbourne swarming out into the regions. I say build a wall separating Melbourne from the rest of Victoria before the whole state is ruined. Limiting the infestation to Melbourne is the best outcome for the entire state. I support building a wall around Moe, deporting the worst of the worst into it, live-stream the ensuing Hunger Games. Profit. It would be nice to think Matthew Guy had a lightbulb moment, but his past should see him largely ignored, unless there’s some sort of enquiry into his dealings (point 2 on). Some examples … (1) previous comments on population (dismissing immigration as an unimportant component of population growth) (2) when Planning Minister his Fisherman’s Bend rezoning fiasco, blatantly giving super profits benefits to some developers ignoring his own department’s advice and omitting provisions for infrastructure, so meaning Victorian taxpayers will end up paying vast amounts for the land for that infrastructure (3) the Ventnor rezoning fiasco (again ignoring his own department’s advice) and subsequent ‘un-rezoning’ and confidential compensation at the Victorian taxpayers expense (4) being a senior member of the Naptheine government responsible for the secret side letter to the developers of the discredited (in terms of cost/benefit) East West link, costing Victorian taxpayers 100s of millions (5) the dog box apartment boom in the CBD he presided over (6) his bizzare rerouting of the Melbourne Metro to include a station at Fisherman’s Bend to make the apartments to be built there more attractive because it was ‘common sense’ – fortunately subsequently completed ignored. Squibbing on the issue the of immigration numbers with his nonsense about exporting the disaster of rapid population growth to the regions shows he isn’t serious about the issue, just trying to tap into the general discontent over an ever more crowded and dysfunctional Melbourne with throwaway lines. 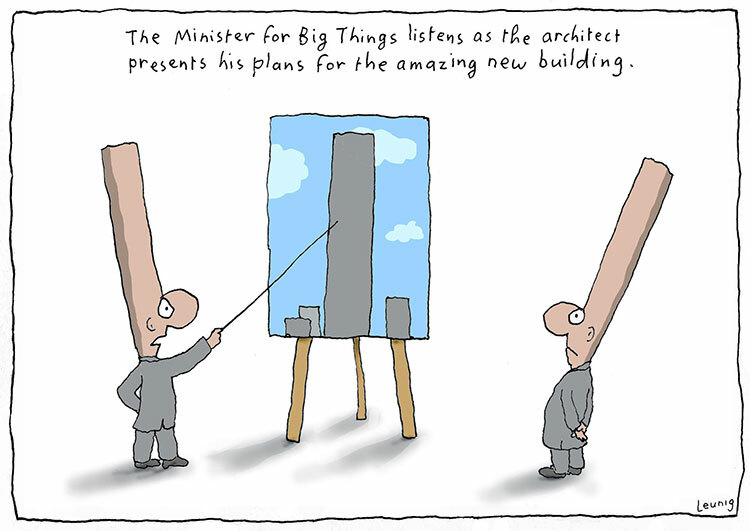 Matthew Guy will be best remembered for his stated goal to Manhattanise Melbourne, so he approved every dogbox tower that came across his desk – the denser the build, the better. Most of these were of poor quality and at a density not allowed in other major world cities, but that didn’t matter – Matthew Guy’s ego was the most important thing. Leunig has a great cartoon called which I’m sure was about Matthew Guy.